I was in Las Vegas in May for the ZorkFest conference. This trip I decided to try the Paris Las Vegas Casino & Hotel. I have not stayed there before and I was pleasantly surprised by the hotel. We ended up in a comped suite (from play) and we had a connecting room that our friends stayed in as well. I will review the suite and put the pictures of the standard room below in a slideshow as well. The standard (Burgundy) rooms range from $100-$300 and the suite goes for $350-$700 depending on the dates. Prices in Las Vegas vary widely depending on when you go. There is also a $39 a night resort fee for non diamond member. The Paris Las Vegas hotel & casino is located between Planet Hollywood and Bally’s. The popular Bellagio fountains are located across the street. Many of Paris’ restaurants have a great view of them which makes the location a nice perk of the hotel. The check in area was long and narrow. We arrived around lunch time on a Friday of Memorial Day weekend and it wasn’t busy. I went into the separate Diamond/7 Stars check in area. The desk agent had an issue finding two rooms that were connected. After a 15 minute wait the desk agent was able to get the rooms opened up for us. It was slightly frustrating that it wasn’t a smooth check in, but nothing major. She directed us to the elevator banks which are located past the casino and into the restaurant row area. All of the elevators are located in the same place, which is nice. The elevator banks are separated by floors so be sure to pay attention the first time. This set up seemed to improve the wait times compared to other Las Vegas hotels. The room had an understated elegance and a soothing color selection. Upon entering the room we were greeted with a very large, open bedroom. Because of the size of the room the dresser and TV were pretty far away from the bed. The TV was way too small for the distance. It actually looked kind of foolish when you were in bed. But, you don’t spend a lot of time watching TV in Vegas, unless you are Bethany :), so overall not a huge deal. There was also a mini wet bar and fridge off to the side of the bedroom. There is a long hallway that leads to the bathroom. It is located on your left and the walk in closet splits off to the right. There is a makeup desk with a mirror on your way to the closet. The bathroom was the standard set up these days, having a tub and a separate shower. The bathroom had a large double vanity, which was a little dated, and a separate room with a toilet and bidet. The Paris Las Vegas Hotel & Casino has a lot of dining options to chose from. The most known is probably the iconic Eiffel Tower Restaurant. During our stay we only ate breakfast on property but both were excellent. We ate at Hexx and Mon Ami Gabi. Both locations have amazing patio seating overlooking the Bellagio fountains. The perfect setting paired well with the serene Las Vegas mornings, when most people are still sleeping. There is a lot to chose from on site though. Gordon Ramsay has a steakhouse in the casino, Martorano’s offers italian food, Le Burger Brassiere is located down the walkway to Bally’s and is very good (we have eaten there in the past). There are also little cafes, a buffet, and La Creperie. Paris Las Vegas has lot of options to say the least. You can see the entire list HERE. But what about the pool? That is the all important question. To be honest the pool is kind of basic as far as Las Vegas goes. But, there is a ton of space and loads of chairs which is always an issue in Vegas. It is basic because it is just one really large octagon type shaped pool. Another thing worth noting about the pool is that it is adjacent to the Eiffel Tower so you will get some overcast shade throughout the day because of it. Be sure to find a seat that will be in the sun or shade depending on your preference. They of course have music and immensely overpriced drinks for your convenience as well. There are also cabanas for rent but I don’t think they would be very beneficial at this particular pool. Back inside, the casino tries to make you feel like you are walking the streets of Paris. The ceiling is painted to reflect the sky, there is fake shrubbery throughout, and even some metal mixed in. The legs of the Eiffel Tower crash through the ceiling for a cool effect as well. They did a great job with the design aspect. It is a more sedated gambling experience aimed at a middle aged clientele. The other amenity worth noting is the actual Eiffel Tower experience. We did not do it this trip but did it around 10 years ago. It is worth the cost of admission but go at night to ensure you get the best Bellagio fountain experience possible while you are up there. The Paris Las Vegas Hotel & Casino is a great option for your next trip to Vegas. It has a pretty good location, beautiful design, a plethora of dining options, and a very nice casino. The pool, while vanilla per Vegas standards, offers plenty of seating and a large swimming area. 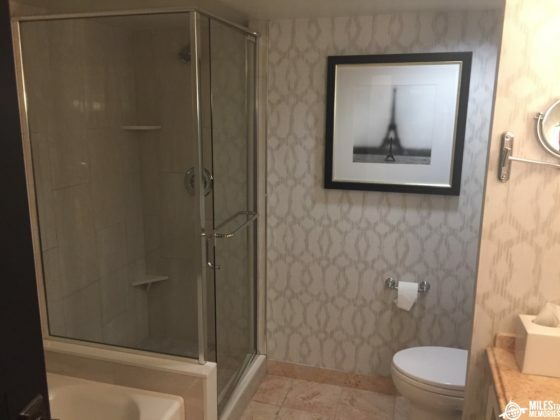 It also has a cool view of the Eiffel Towel while lounging. I have stayed at many properties in Las Vegas and the Paris Las Vegas Hotel & Casino can hang with the best of them. The standard room was well appointed with good size and the bathroom offered a separate tub and shower. 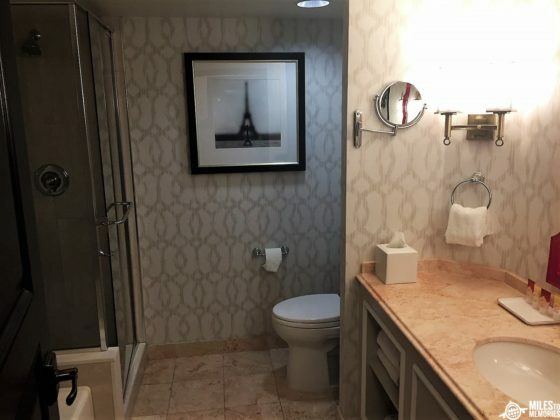 The Paris Las Vegas Hotel & Casino has a great location, a lot of amenities, and let me pleasantly surprised. It is the higher end of the middle tiered hotels in Las Vegas. It gives you some of the feel of luxury without the full price tag. I like the Paris hotel. It’s relatively compact so not a lot of wasted walking to/from rooms. Nice buffet for breakfast. GR Steak is ok but try his new Hell’s Kitchen too. I wouldn’t waste your $$ on the suites – they aren’t that fancy. Comped rooms are always the best. If you don’t gamble enough to get comped rooms, spend your money on a Corner View room or a suite at Aria. Or if you like something a bit different try Nobu within Caesar’s. I agree on the suites. I wouldn’t have been happy paying for the upgraded room. It was nice and spacious but it wouldn’t be worth the difference in money vs the standard room next door. Nothing makes me smile more than “Le Diamond Check-In.” The “Fren-glish” is hysterical. I’ve been laughing at that sign for years. They actually had a concierge-level type lounge (in the high 20s, floor number) for a lot of years. I never visited it, and people did not really speak much about it. Did not really “tie-in” with Total Rewards. It is pretty comical. Interesting tid bit about the extra lounge that does seem a little strange since they have the Diamond Lounge on site. Still would have been cool to check out…now I will probably go picture hunting for it lol. (This is from memory, mostly) When Paris first opened, it was NOT part of Total Rewards. So, there was no Diamond Lounge to speak of. I think the concierge lounge (for lack of a better term) was supposed to be some supplement add/on. When it opened the property was built/owned/operated by Bally’s/Park Place Entertainment. They had some significant casino action when they first opened. I seem to recall reading a few stories (has to be years ago now) about big players and credit lines. For all I know, perhaps the lounge is permanently closed or has been removed. Though I was there for NYE about 10 years ago +/- and I remember my suite was on the same floor as that lounge which reminded me of it. I started staying a bit at Paris after Stardust closed. Very interesting – thanks for the info. I think Paris will be in the regular location for us going forward. I didn’t think I would enjoy it as much as I did. I did forget about that since I don’t pay resort fees as a diamond member but I will add that in.